One of the greatest building enterprises in the history of the world is the Great Wall of China. Not so much one wall as a collection of ramparts, the punctuated Great Wall straddles China from the Yellow Sea in the east to its crumbling finale in the Gobi Desert. In its entirety, it is 6,430 kilometres long. Importantly, the wall is not the work of any single dynasty. Began as early as the 7th Century BC, it only took on its mammoth character under Qin Shih Huangdi (221-210 BC), the first emperor of the Qin dynasty that unified China. He threaded together the existing ramparts, erected watchtowers, and constructed beacons on the fortifications to alert the capital [present day Xi’an] of attack. 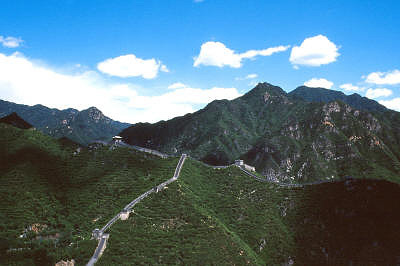 The wall advanced with the Han dynasty (206 BC-220 AD), which further extended Qin Shih Huangdi’s efforts into the Gobi Desert. The Ming dynasty (1368-1644) heralded another spate of enthusiastic construction. They encased sections of the wall which had been constructed principally of rammed earth, in brick. Slaving at the wall was a diverse assortment of alienated farmers, soldiers, and prisoners, many of whom died of exhaustion or malnutrition. The purpose of the defence was to keep the hostile tribesmen of the north out of China. It failed completely, most notably with the incursions that established the dynasties of the Yuan [Mongols] and Qing [Manchu]. 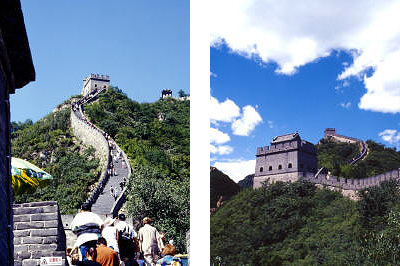 The wall can be visited at Badaling, the most commercialised part, Mutianyu, and Simatai, the most secluded part. I visited Mutianyu, 90 kilometres north-east of Beijing. Three thousand precipitous gigantic steps over a distance of just a mile long spread ahead of me, disappearing into the sky. Thirty steps at a time followed by a rest came down to twenty steps and a much needed rest, and eventually ended in ten steps with no choice but to rest. Honestly speaking I doubted if I would ever make it to the end. I ran out of drinking water in just a few yards. I’d pass one watchtower, and hope that it was the last, but there were always others ahead, before the wall plunged into its punctuated dead end. But I wasn’t going to give up. So on I trudged, exchanging notes on Egypt and Peru with fellow travellers, till I finally reached the summit. What a sense of achievement it was. Exhilaration. To have literally reached the top and end of one’s road. And that too a very difficult road by a rather unfit person. For the way back I hiked down the hill. I thought it would be easier. It was dramatic and exciting and adventurous. Loose weathered rocks piled precariously on the slopes with no railing and the wind gushing headlong at me. I couldn’t wipe the thrill off my face for even a moment. The Ming Tombs constitute one of the city’s most historical sights. Grand and solemn, they display some of Beijing’s finest carved stone and majesty of centuries of imperial lineage. The founder of the Ming dynasty is buried in Nanjing, but there are 13 emperors interred here including Yongle. A set of gateways in which stands the Stele Pavilion holding a large engraved stele eulogising the Ming emperors leads to the tombs. Beyond lies the long graceful Sacred Way lined with statues of animals, some mythological, and officials. The emperor’s coffin would have been conveyed along this route to his tomb. To reach the tombs, the avenue crosses a seven-arched bridge over water before fanning out to individual crypts, thus avoiding straight lines which are prohibited in feng shui. When the imperial tombs were originally sealed, they contained a horde of gold, silver, lacquer, porcelain, and other riches to accompany the departed emperor; these were later plundered by thieves. The tombs today are bare. Buried deep underground, crowds file past poker-faced coffins, searching for sagas and chronicles of times past within the barren, vacant, grey plastered walls. Tombs often consisted of either one chamber or an inter-connected cluster. The vault was covered by a mound of earth, fronted by altars and halls and a strip of water to deflect bad spirits. The governing aesthetic was imperial and Confucian, rather than Buddhist or Taoist. Dinner was Peking Duck. Not that I had any. I was slowly accustoming myself to the food. Eating with chopsticks, managing to relish at least part of what was served, and getting used to the fact that when you ordered chicken, its skinned head with bulging eyes and angular crown adorned the platter as well. But I still was a long way away from Peking Duck, Beijing’s most famous dish, consisting of a rich preparation of oily duck flesh, plum sauce and onion, which one ate rolled into a wafer thin pancake. I had French fries with my chopsticks instead. After dinner I walked through Wangfujing, the premier pedestrian-only shopping street in the city, leisurely taking in the sights and sounds. A squat, square, merry rustic cut my way with his cycle rickshaw, offering to take me back to the hotel. I just jumped at the offer. A ride back to the hotel via Tiananmen Square? Yes! And off I went on a roller coaster topsy turvy ride. We chatted incessantly. He in his Chinese. Me in English. With expressive hand signs and both of us doubled over with laughter through most of the jaunt. He took me through the airy square twinkling in the night and then went the extra mile, taking me into the inner ramparts of the Forbidden City, cycling by the moat. It was magical. Dark, enormous, mysterious, solemn. With looming shadows and soft golden lights. The Forbidden City was beautiful during the day. At night, by its own lone self, it was astounding. My last morning in Beijing was spent at the Summer Palace, a sprawling imperial cluster of temples, pavilions, and halls set in a park around the vast Kunming Lake. The imperial family of the Qing dynasty (1644-1912), also known as the Manchu dynasty, once used this wonderland as a summer residence. The buildings date from the early 1900s. Long before that, the site was a royal garden and retreat. There are many interesting structures within. In the Hall of Benevolence and Longevity the empress dowager sat on her throne during her time of power. The fascinating statues in front of the hall include a qilin, a mythical chimera often seen in Confucian and imperial buildings. A hybrid of a dragon, lion, deer and other animals, the creature is believed to have appeared on earth only during times of harmony. 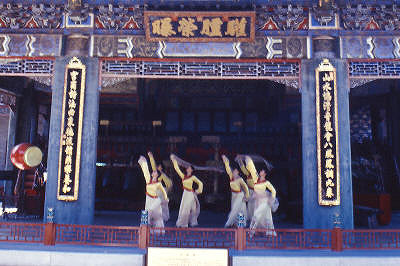 In the impressive theatre in the Court of Virtue and Harmony, Empress Cixi is said to have dressed up as Guanyin, the goddess of mercy. The Hall of Jade Billows is where Emperor Guangxu was kept under lock and key after his involvement in the 1898 Hundred Days of Reform Movement which attempted to introduce modern ideas. The 17 Arch 150-meter bridge spans the lake in graceful curves. Narrow-minded and autocratic, Cixi (1834-1908) was virtual ruler of China for about 50 years, during which time she resisted attempts at modernising the country. 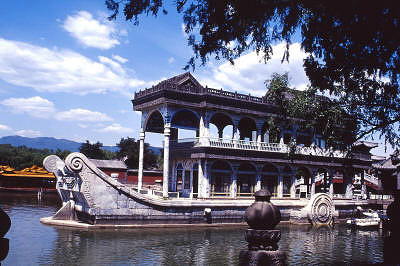 Funds which were originally allocated for the modernisation of the Qing navy, for example, were used instead to build the empress her sumptuous summer palace. Also known as empress dowager, or Old Buddha, Cixi began her rise to power when, as a concubine, she had a son by emperor Xianfeng (1850-1861). The boy, Tongzhi, became the emperor (1862-1874) at the age of five. On his death Cixi installed her nephew Guangxu (1875-1908) as emperor in contravention of the laws of succession. Throughout her life she dealt in political intrigue and eventually ruled the court with an iron fist. One of the last acts of Cixi was to appoint the 3-year old Pu Yi as emperor in 1908. This entry was posted in China, Exploring our World and tagged Chinese Civilization, Empress Cixi, Great Wall of China, Ming Dynasty, Ming Tombs, Peking Duck, Qin Dynasty, Qin Shih Huangdi, Qing Dynasty, Summer Palace, Things to do in China, Things to see in Beijing by Rama Arya. Bookmark the permalink.